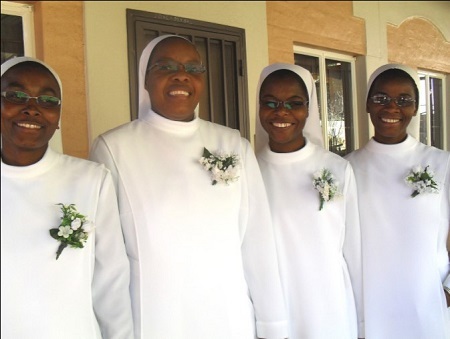 October 26, 2013 was the day the Lord made for us, Novice Emma Aindongo, Novice Letisia, Novice Marina Gabriel and Novice Ester Andowa. It was our First Profession of Monastic Vows, a day of joy and happiness from the Lord. Indeed, it was a memorable day both for us and our Congregation, the Missionary Benedictine Sisters of Tutzing, the local church, our family, relatives, guests and friends. We began our preparations with Mother Maria Ignatius Glaser, our Prioress, giving us input on our monastic vows and how we live our charism on Oct. 17, 2013. The retreat continued with Sr. Marita Haarmann, as our facilitator. With her effort and God’s grace, she made it interesting and informative. We received spiritual guidance especially on serving God in community, how to love others as our neighbors, silence, and how prayer fills our whole being and others. Fr. Rick Bauer, M.M., our current chaplain, came especially to hear confession. We thank them all and our Formators, teachers, and work officials for helping us to become new persons. With God accompanying us in the journey of faith, we enter a new stage ready to take up our cross and follow Him. We are most grateful to our Vicar-General Fr. Werner Afunde, the main celebrant and the concelebrating priests of the Eucharistic Celebration of our First Profession. Fr. Afunde entrusted these words to us: “To follow Christ is not easy, but if you have a strong faith, your cross will be lighter. We must have the courage and motivation to live our vocation.” Fr. Afunde compared our religious vocation to an uncooked egg. If we drop our vocation, it will break like an egg and we cannot pick it up anymore because it is spread all over the ground. It was a wonderful surprise to see our St. Benedict Priory House Chapel full of witnesses to our First Profession of Monastic Vows.